Eleanor said: "My favourite bookstore currently in Derbyshire is Scarthin Books, Cromford. It's a 3-storey house over the millpond, crammed to the rafters with everything from new fiction to second-hand rare gems, sheet music to archaeology books. There's a well-stocked children's room, and a cafe and loo." Scarthin Books has, over the years, become somewhat a real tourist attraction. The cases where people visit the little village of Cromford just for the sake of Scarthin Books are certainly not rare since the bookstore itself is highly praised for its huge stock of over 80.000 (!!!) books, excellent, knowledgeable service and a famed café overlooking the grapevine. 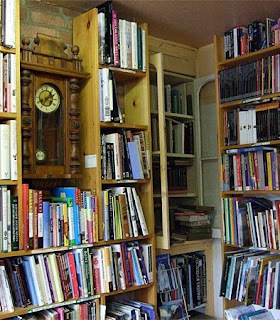 Many agree that this bookstore is very very hard to leave. 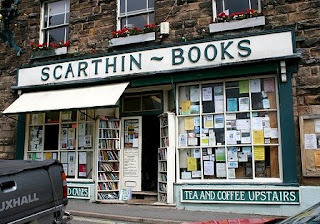 Scarthin Books was opened in 1974 by David Mitchell and since then it struggled to grow in this competitive book market, blossoming from a one room bookstore to a twelve room one with offices and a warehouse (in order to do this, David had to buy a house next to the original store). People in Scarthin Books pride themselves in stocking three times as many titles than your ordinary chain stores despite Scarthin Book's obvious space deficiency. Scarthin Books boasts about 'specializing in not specializing' - meaning that they stock (of course, almost) anything you can imagine. Well, no wonder since the stock consists of some 40.000 new and 45.000 secondhand books. The bookstore also has a special children's room stocking a wide selection of books for the little ones. Another thing for which the bookstore is praised is the café, serving organic and vegetarian food (David is an organic gardener). One is able to hire the café for lectures or meetings of various sort for low prices. Furthermore, Scarthin Books is also a publisher and a major supplier of schools, colleges and libraries.